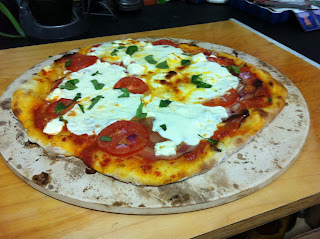 Beauties and the Feast:: “Foolproof Thin-Crust Pizza"
Okay the truth is I have wanted to try this recipe for a long time. And in fact you may see it again another month with a different ingredient! But as we’ve seen with other Pancetta posts almost anything can have some gourmet bacon thrown on it and it will taste great. 2. Add oil and salt to dough and process until dough forms satiny, sticky ball that clears sides of workbowl, 30 to 60 seconds. Remove dough from bowl, knead briefly on lightly oiled countertop until smooth, 1 minute. Shape dough into tight ball and place in large, lightly oiled bowl. Cover tightly with plastic wrap and refrigerate for at least 24 hours and up to 3 days. 3. One hour before baking pizza, adjust oven rack to second highest position, set pizza stone on rack, and heat oven to 500 degrees. Remove dough from refrigerator and divide in half. Shape each half into smooth, tight ball. 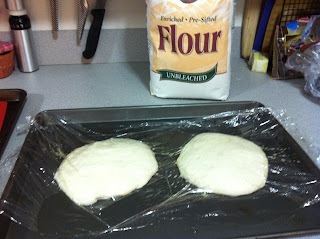 Place on lightly oiled baking sheet, spacing them at least 3 inches apart; cover loosely with a plastic wrap coated with nonstick cooking spray; let stand for 1 hour. 4. Coat 1 ball of dough generously with flour and place on well-floured countertop. Using fingertips, gently flatten into 8-inch disk, leaving 1 inch of outer edge slightly thicker than center. Using hands, gently stretch disk into 12-inch round, working along edges and giving disk quarter turns as you stretch. Transfer dough to well-floured peel and stretch into 13-inch round. Using back of spoon or ladle, spread ½ cup tomato sauce in thin layer over surface of dough, leaving ¼ inch border around edge. Sprinkle ¼ cup Parmesan evenly over sauce, followed by one cup mozzarella. Slide pizza carefully onto stone and bake until crust is well browned and cheese is bubbly and beginning to brown, 10 to 12 minutes, rotating pizza halfway through. Remove pizza and place on wire rack for 5 minutes before slicing and serving. After reading this three page instructional article, I thought the end result would be an explosion in my mouth! With such high expectations the little imperfections made it hard for me to make a fair assessment. My husband ranted and raved, which gives me inspiration to try again. A couple lessons learned: go for the Semolina flour because the baking flour on the bottom of the pie didn’t add to the taste. I turned my oven down to 450 after I put the pizza in to make the second pie not so brown. The pizza stone was pretty great, although I think it takes some practice on how you take the pizza that is made up and transfer it to the pre-heated stone without it catching and scrunching up. The next step will be perfecting the ingredients. I may go on a pizza exploration over the upcoming winter months. I'm ready for comfort food season to begin! Yum, I love homemade pizza! I just use a $2 tile from the hardware store (instead of an official pizza stone) and always use foil and a little cornmeal so it doesn’t stick. 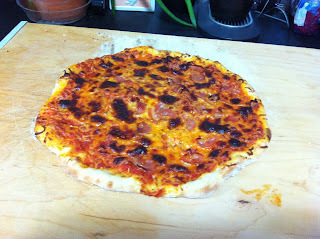 This crust recipe looks awesome and I bet your pancetta pizza was incredible! 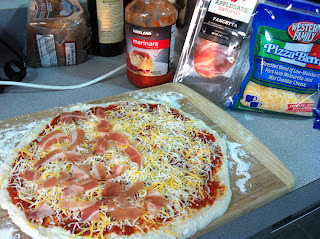 We should make homemade pizzas at our next girls get together! You and the baking, I am so impressed! I don't know if I can veer from the ease of my Trader Joe's take n bake dough, but I will definitely try the pancetta topping. Nice post! That sounds great Jolie! I am impressed!